Our parties extend to the outside at the gazebo, and our doll houses in the spring and summer. We love doing Mad Hatter tea parties at our doll houses, and ladies, mother/daughter or Victorian teas at the gazebo. School hours are popular for pre-schoolers, and home schooled organizations. Our Saturday parties book quickly, therefore, you want to book early. 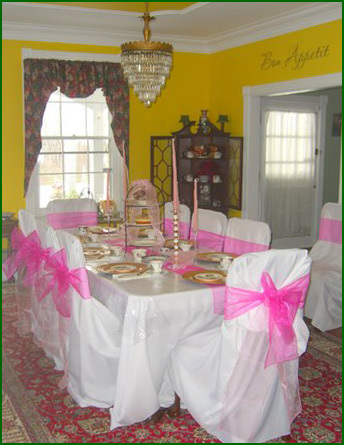 A lunch tea party or early evening is perfect for the Ladies, or Children's birthday party. Both Children and Ladies parties have separate menus. A tea party is a wonderful way to communicate with your friends and family. Our Children's tea parties have three different themes for indoors. Each tea party is special. A Princess, Teddy Bear, or Victorian Tea party is perfect for any Birthday. The ladies can enjoy a Mystery Tea Party or a Victorian Tea with their friends. Our tea parties serve a maximum of 10 people. We are ready to serve 8 people normally, but will extend to 10 people if we are given advance notice. The cost would be $35.00 for each additional guest. We can accommodate a larger group on a Sunday or late Saturday. Check reservation desk for details 301-758-0514.